There was an interesting thread in the PowerCLI Community today. It raised the question how one could report on the current vCenter sessions, including the IP address or hostname from where the session was started. Unfortunately the SessionManager doesn’t hold any information from where the session was started. But there are other ways of finding that information. The UserLoginSessionEvent object has a property, called ipAddress, that has the information we’re after. Btw if you are only interested in looking for idle sessions, independent from which host they were started, there is a great post, called List and Disconnect vCenter Sessions on the PowerCLI blog. 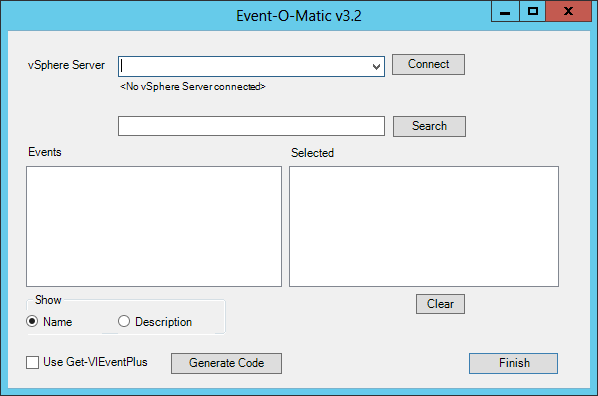 Update May 4th 2012: function updated to handle multiple vCenter connections. The VMTN Communities have always been a useful source of inspiration for writing scripts. This week, for example, there was an intriguing question raised in the Onyx Community. The user wanted to know if it was possible to monitor changes in the vSphere environment in real time. As far as I know there is no API in the vSphere SDK to do real time monitoring. But the EventHistoryCollector can deliver something that I prefer to call nearly real time monitoring. The following script is a very basic function, written primarily to show that this principle of nearly real time monitoring works. The function displays some selected properties of each event it sees. Another idea triggered by a post in the PowerCLI Community. Lars wanted to know where his VMs had been running in the past. Since vSphere doesn’t maintain any historical data with the guests themselves, we have to fall back on the Tasks and Events to create such a report. The basic algorithm to query the tasks, and their related events, is already published in Events – Part 3 : Auditing VM device changes. But to get a historical record of the servers where your guests have been hosted requires a bit more logic in the script. add-on that produces extended events, is the Update Manager. With the recent introduction of the vCenter Update Manager PowerCLI snapin, it is now fairly easy to automate all aspects of patch and update management in your vSphere environment. And with the help of the extended events produced by Update Manager, you can easily produce reports. This post shows one way of doing this. Events – Part 5 : Powered off for more than 1 week ? An interesting question was raised in the PowerCLI community by Jörn. He wanted to find all the guests that had been powered off for more than a week. Before you tackle such a request, it is useful to sit down and think a bit about the solution. If you are going to search through all the events in your vCenter to answer this question, you could be in for a surprise. Depending on the size and activity of your vSphere environment this straight-forward solution could run for hours ! But there is a better way of doing this. Yesterday, Cody published on his Professional VMware blog an excellent article, called vSphere Host Died Abandon Ship! – vSphere vCenter Alarms & Actions. The article shows a very elegant solution how to move your guests to “safer havens”, the moment one of the hosts in the cluster starts experiencing hardware problems. The elegance of Cody’s solution is that he uses maintenance mode to force vMotion on all the powered-on guests on the host that experiences HW problems.